Dr. Watts is available to speak for businesses, community and church groups and organizations on a variety of health-related topics. Dr. Watts is available to speak for businesses, community and church groups and organizations on a variety of health-related topics. Each presentation is customized to your group’s size, interests and demographics. 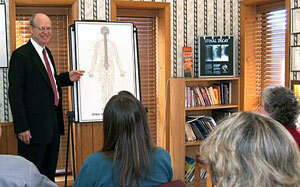 Dr. Watts provides a variety of workplace wellness programs for area businesses. Wellness programs can include: Headaches, Stress Reduction, Nutrition and Weight Loss for Maximum Performance, Healthy Living at Any Age and Women’s Health among others. 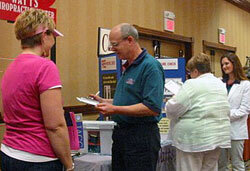 Dr. Steven Watts conducting a spinal screening at a health fair. We also offer free spinal posture screenings at area businesses and health fairs for employees or customers. These programs are all offered as a community service at no charge. For more information or to schedule a program, please call our Maryville chiropractic office at (865) 983-3333 or click the email link at the bottom of this page.